Scientists sequenced the genome of a girl who lived in Alaska 11,5 thousand years ago, and carried her to a previously unknown and probably the first group of settlers from Eurasia to America. North and South America became the last (except for remote islands) parts of land inhabited by man. Today, historians and anthropologists, based on the results of genetic studies and archaeological finds, believe that people of the modern type left Africa about 100 million years ago and gradually mastered Eurasia, then (about 40 thousand years ago, although there are assumptions about an earlier date) Australia and the islands around it, and then, passing through Siberia, reached the edge of Asia. It is generally believed that people in Alaska were caught passing the shallow Bering Strait at the end of the last ice age no earlier than 22-23 thousand years ago and approximately until the ninth millennium BC. remained in the north. Up to now it has been known about two groups of Paleo-Indians (first ex-Americans to America) in Alaska, northern and southern. In early January, an article was published in the journal Nature, in which an international group of geneticists, led by Eske Willerslev, presented the results of an analysis of mitochondrial and nuclear DNA extracted from human bones found in Alaska. The results suggest that the first settlers from Eurasia found themselves in Alaska 20 thousand years ago, as a result of a single wave of migration. The first settlers were representatives of the previously unknown population of the first Americans, which the authors called “ancient Beringians” (Ancient Beringians), from which later separated the northern and southern groups of Paleo-Indians. Scientists sequenced the genome of a three-year-old girl whose remains were discovered in 2013 in the valley of the Tanana River in Alaska. At the end of the last glaciation, this area, now coastal, was part of an array of land that connected Eurasia and America – Beringia. 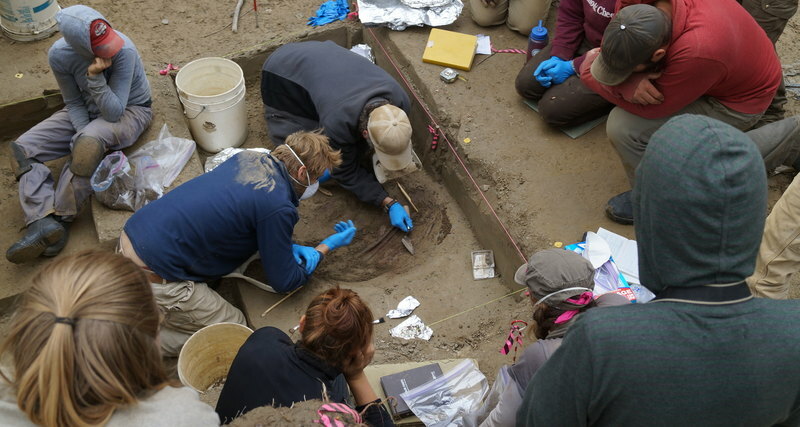 The dating of the remains showed that the girl was born about 11,5 thousand years ago, however, to the surprise of the researchers, her DNA did not correspond to any of the two known branches of the first settlers to America. Comparing the DNA of the Beringians with the DNA of modern Indians and the previously sequenced DNA of the ancient inhabitants of Alaska, scientists found that the Beringians are genetically closer to the modern Indians of North America than the Asian and European ancestors of the latter. An analysis of the girl’s genome from Alaska also solved the old problem of the number of migrations to North America. Until now, scientists did not know whether the northern and southern groups were divided even before crossing the Beringia, or already in America. A girl from the Tanan River valley belonged to a group of people separated from the common ancestor of Paleo-Indians before the separation of the northern and southern groups, but after the common ancestor of all three populations separated from the populations of people with whom they lived together in Eurasia. These conclusions led scientists to the conclusion that the transition through Beringia took place only once, and all subsequent divisions of Paleo-Indians occurred on the territory of North America. The separation of future Paleo-Indians from their Siberian relatives occurred, according to the authors of the work, about 36 thousand years ago due to very limited and local contacts of residents of the far north-east of Eurasia with other populations of people. These contacts stopped about 25 thousand years ago, probably because of the sharp climate change that led to the complete isolation of future settlers and the beginning of migration to the east.